Listening is most frequently associated with hearing through the ears but we have many sources of hearing, through our heart, our intuition and all of our senses. Engaging and listening with our body awareness and intelligence is a practice of quiet patience, which frees us up from the chatter of inner and outer voices and the desensitizing sounds of telephones, computers and environmental noise. Engaged listening is hearing between words and beyond what is spoken, focusing on listening to what the speaker holds relevant, essential and most important. Through the practice of holistic listening, we can increase our self-awareness to become more aligned with, and authentically present in our actions. This experiential, reflective workshop provides multiple opportunities for participants to practice and expand their listening capacity and capability. Anyone interested in developing their capacity to listen deeply; especially relevant for managers, coaches and professionals engaging in collaborative or developmental work. For Questions or registration, we're here to help. Increase your range of communication, including body language, to ensure the integrity between the message you convey and the one you intend. Date and Time: Wednesday, November. 28, 2018 from 9 a.m. to 4:30 p.m.
Join the adventure with your fellow horse and human herd members for the Experiential Learning with Horses 2019 program. It is an honor, privilege and responsibility to engage with horses and to support people in their learning, healing and growth through experiential learning with horses. Each of you has supported the horses and people with your own unique gift of presence and skills and with absolute care and kindness, honor and respect. NEW THIS YEAR: Bring your coaching and facilitation to life with experiential learning activities, constellation experiences and a systemic approach to understanding our life’s most important questions. Fees and Financial Commitment: $2,550 for the training program. Program Times: Program meets Wednesday 3:30 - 8:30pm, Thursday, Friday and Saturday 9:00am - 5:30pm, and Sunday 8:30am - 2:00pm. Application Process: Completed application form. A $250 refundable deposit is requested with your application. An interview is required by telephone or in person before acceptance to the program. 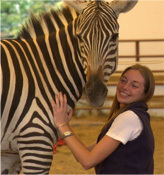 Faculty: Jackie Stevenson and the Pebble Ledge Herd of seven horses and a zebra. The format of the 2019 Experiential Learning with Horses Practitioner Certificate Program will be four and a half days with a total of 44 hours of program time. 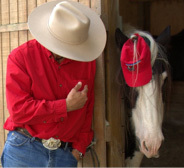 Each day will provide a theory base, practical horseperson skills, experiential learning with horses and nature activities, personal mastery and self awareness learning, and facilitation practice with horses and people. The program provides real time, action-oriented experience with hands on opportunities to apply what you learn and to receive immediate feedback from faculty, fellow participants and from the horses. 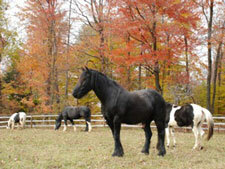 We will be working with a natural herd of seven horses and one zebra. You will have the opportunity throughout the training to practice what you learn with real clients. There is no riding. The focus is not on traditional horsemanship and the horse engagement takes place on the ground. 1) Being authentically and intentionally present, what you bring that is uniquely your own gift. 2) Communicating with awareness of embodied presence and body language. 3) Paying attention to four levels of system with a 360 perspective and collective wisdom of the field. 4) Listening and engaging to create the conditions for the best possible future to emerge through the physical, earth and social bodies. 6) Creating a Culture that contributes to the cultivation of human beings who are creative, adaptable, independent and interdependent in both thinking and in managing one's life, and that work towards a more peaceful world with a strong concern for and dedication to the future of humanity. The professional competencies you will develop as an Experiential Learning with Horses Practitioner can be applied in a variety of business, coaching, counseling and educational settings with broad range applications including working with individuals, families, groups, or organizations. This certificate program is designed to prepare you in facilitating positive change with people of all ages. Horses change our lives. The relationship with horses challenges us to expand into our potential, to be authentic in our human relationships, to be clearer about our purpose in life and to contribute with choice to the well being of the world. To create an honest, respectful and trustworthy relationship with horses in service of human development. To offer a premier training and certificate program furthering the work of this unfolding professional field of horses helping people and preparing its emerging practitioners. To be of service to communities by accessing what we know about horse and human relationship and bring those resources into peoples’ daily work and life. To raise consciousness of our ecological identity and ecological responsibility and to follow a path that benefits future generations. Horses Challenge Us to be Our Best. Horses are remarkable teachers of leadership and facilitators of team development. They have an amazing ability to resonate with our true emotional intelligence, offer a 360 perspective and reflect back to us our authentic self. We learn from the herd to create a community of purpose, expand our humanity, create the best possible conditions for a positive future to emerge and then be there to greet it. - Creating Positive Relationships: Communicating and interacting with awareness of body language and energy, inclusiveness, interdependence and interconnection. Exploring the language of horses and the natural world. - Strengthening Positive Team Performance: Developing awareness of and respect for systems thinking, multiple realities, perspectives and levels of system with a 360 vision of the field. Experiencing constellations. - Inspiring a Positive Present and Future: Listening and engaging positively and optimistically to create the conditions for the best possible and most meaningful future to emerge for the whole and then being there to greet it. People partnering with horses for action based discovery focused in the moment, learning experiences relevant to real time issues and authentic work situations. Powerful experiential and accelerated knowledge opportunities whereby personal insight, learned information and skill development is immediately internalized. 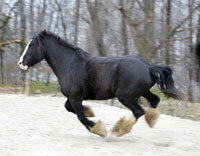 Horses can bring a high degree of chaos and unexpected change. We learn to summon moment to moment calm, strength, focus, respect, and trust to maintain a mutually safe and beneficial working relationship with the horse - all skills essential for teamwork. 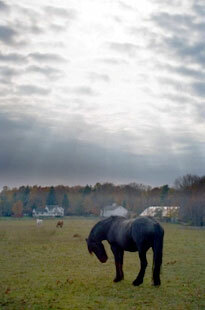 Engaging with horses in focused and reflective activity challenges us to learn how to think rather than what to think. Horses offer immediate feedback about our presence, emotional intelligence, and embodied language. Engaging free spirited horses inspires our dreams and visions, frees our passion, carries us beyond our limiting patterns and helps us reconnect with our inner knowing, our primal instincts, intuition, and our natural compassion. Learning with and from the horses we discover how to think rather than what to think. Learning with horses we can listen beyond words into the heart of the matter.